Dark Dimensions: City of Fog Walkthrough steers you through the once-vanished, now-reappeared village of Silvertown, Maine. Assembled by the CGG staff with full details and screenshots from actual gameplay, the Dark Dimensions: City of Fog Walkthrough will help you put to rest the souls of Silvertown through solving mini-games and gathering helpful items in hidden object areas. Few things are as creepy as fog. Shroud a perfectly normal building in mist and it becomes an otherworldly den of mystery. So when you blow some fog around, a fairly straightforward hidden object adventure game suddenly becomes an atmospheric thrill ride through a strangely disappearing-reappearing town of pining ghosts with some unfinished business. 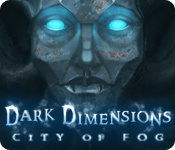 Dark Dimensions: City of Fog does an excellent job of immersing you in a city lost in time. From the late Victorian era photo studio to the doctor's apothecary, the visuals are startlingly accurate. Every scene suggests that the inhabitants left just moments ago - not a century-plus - and you never know if they could return at any moment to be of help or harm to you. You'll enjoy a fairly unique set of mini-games in between the hidden object areas, including one apocalyptic "chess game" that pits angels vs. demons. Move through this mist-shrouded village using the Dark Dimensions: City of Fog walkthrough as your town map. Flip it open when you need a little direction or keep it as your fog-busting GPS as you solve the mystery of this Dark Dimension.